My friend and I had such a wonderful time with our kids last night! 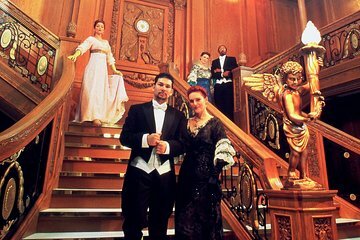 I teach a unit on the Titanic every year and I’ve been very curious about the Titanic Dinner Gala. I learned a lot of facts I didn’t know and I was wonderfully impressed by the talent and kindness of the actors involved. We were there for nearly four hours and I don’t think the actors took a break longer than ten minutes. Thank you for a marvelous evening! This was fantastic. It was a great experience for 4 of us that attended. We laughed, we cried, we learned a lot of new information about that tragic night and the unfortunate people that did and did not survive. I highly recommend this event. The artifacts were interesting and the actors were really good, but I was expecting more. The food was just ok, the dining room was a bit small, but the service was really good. From start to finish your invited to be one of the passengers aboard the titanic when she sailed to America , you are given a character who you should become for the entire experience, the actors are enthusiastic and encourage you the entire time ,the only thing I would ask is your given more time after the dinner to read and peruse the information posted around the different areas and also where you have you dinner could be a little mor decorated to suggest your in the titanic dining area . The meal was excellent..filet mignon and chicken hollandaze...The re-enactment was informative with excellent acting . The sets showing the interior and artifacts of the Titanic was amazing. It was very emotional but educational and well presented in a serious and fun way depicting the background of some of the passengers...It was great value for the money...Don't miss it! I must admit that most of the tour was boring. We arrived at 6 30. The tour started after 7 00 pm and there was not much to see. We were standing for 1.5 hour .I f you are above 60 this is an ordeal.there was no where to sit. By 800 pm we were all hungry. The food was ok,but nothing special. After dinner my wife and I left right away, perhaps missing the most interesting part of the tour. The idea of a titanic dinner is good, but I suppose a real dinner aboard the real titanice must have been far more classier than this!